STATIONEN: EIN KURSBUCH FÃR DIE MITTELSTUFE, Third Edition is an intermediate German program that combines engaging cultural topics with authentic readings and contextualized grammar in a unifying context. Each chapter of STATIONEN revolves around a city or region in the German-speaking world. This overarching concept brings the program together and invites students and instructors to make connections and comparisons between chapters, topics, and cultural issues. STATIONEN also refers to the "stations" between the first beginnings of a journey into German life and language and to more advanced study and exploration on the intermediate level. About: This set of 2 Lab Audio CDs contains the audio portion for the listening and comprehension sections in the Students Activities Manual. About: The video consists of videoblogs from eleven cities in Germany, Austria, and Switzerland. About: NOTE: This ISBN is a standalone Book. About: STATIONEN: EIN KURSBUCH FÃR DIE MITTELSTUFE, Second Edition is an innovative, intermediate German program that combines engaging cultural topics with authentic readings and contextualized grammar in a unifying context. 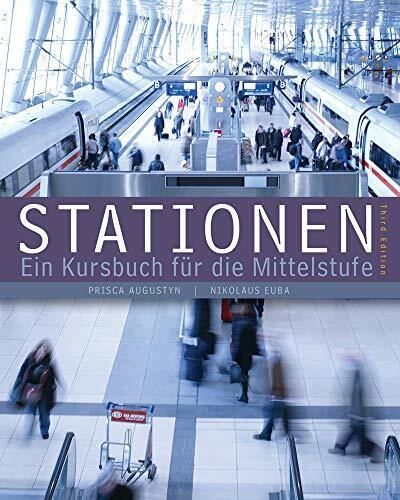 About: STATIONEN: EIN KURSBUCH FÜR DIE MITTELSTUFE, Second Edition is an innovative, intermediate German program that combines engaging cultural topics with authentic readings and contextualized grammar in a unifying context. About: Take a tour of the German-speaking world, with STATIONEN: EIN KURSBUCH FÃR DIE MITTELSTUFE, an innovative intermediate German program.